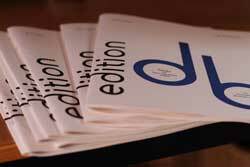 The edition db catalogue is based around several series of publications - see below - ranging from solo music, horn ensemble, brass ensemble, solo sonatas with piano, solo piano music, string quartets, horn trios (hn,vln & pno) to extensive chamber ensembles (including large horn ensembles). Please browse to realise the full extent of the catalogue and purchase items directly via the PayPal links below or via our order form or via other retail outlet links on the order form page. Currently awaiting permission from Boosey & Hawkes who published this in 1936. Currently awaiting permission from Boosey & Hawkes who published this in the 1930s.